The answer to this often-asked question is really quite obvious: Europe and the Middle East share the Mediterranean Sea. Throughout history there have been numerous points of encounter, good and bad ones. There have been crusades and conquests, but there have also been periods during which we have lived together peacefully and even inspired each other. Colonialism and the struggles against it, the encounters and clashes of three monotheistic religions, the search for identity and for territorial belonging have all left their mark. To go to Beirut means to encounter, as in a nutshell, the heritage and the consequences of this history. It means getting to know people who have struggled to live together, while confronting religious, cultural and ethnic differences mixed into claims for political power. Going to Beirut was not easy, given the tensions of the last months. There had been thoughts of postponing the module or shifting it to another place. When the EPIL coordinators, together with the Board and partners in Lebanon, decided to go through with it, security was the major concern. Another concern was to make sure all participants could attend: The visas of the Bosnian group arrived in the last minute, literally. 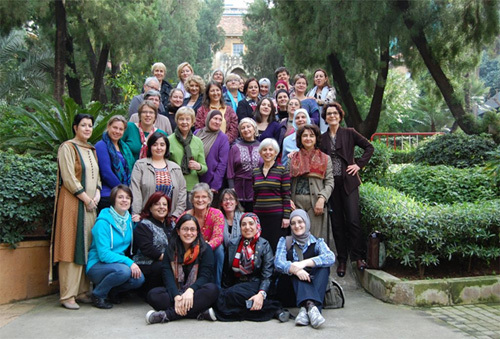 The first part of the module, analysing the religious and political mix of Lebanon as a particular form of democracy and looking at the role and contribution of women in the regional processes of democratisation, took place at the Lebanese American University’s Institute of Women Studies in the Arab World, one of EPIL’s partners in Beirut. The second part was dedicated to encounters with good practice projects devoted to peaceful coexistence and cooperation; these events were presented by local experts and took place in the Focolari centre in Bikfaya. Most impressive was the day EPIL students spent presenting their diploma projects to each other; the projects were developed and written with the aim of transferring what the students had learned into their own professional situation. develop ideas to continue EPIL locally in the Netherlands. From theological reflections about praying together to the value of informal spaces, such as coffee breaks for the creation of an atmosphere of trust, there was a wealth of ideas and concrete proposals. Dialogue had become “biologue” (as an Austrian had proposed in her diploma work on “Dialogical Learning as Biographical Learning”). The graduation took place February 9, 2013 at the Gulbenkian Museum of the Armenian Orthodox Church, Catholicosate of Cilicia in Antelias, with the certificates being awarded by EPIL president Rev. Barbara Heyse-Schaefer and board member Prof. Dr. Manuela Kalsky, Dr. Reinhild Traitler-Espiritu, Teny Pirri-Simonian, Mag. His Holiness Aram I, Catholicos of the Armenian Orthodox Church, former Moderator of the World Council of Church, and a long-time supporter of EPIL, received the group. He spoke to the group, emphasizing that in the reality of a global world only cooperation and opening up toward the other will help us to live in peace. EPIL has now embarked on a process: “The Future of EPIL,” working towards the General Assembly and a public event on that theme, which will take place in Vienna in October 2013.